As of 30th June 2018, the PCI Security Standards Council requires that support for SSL 3.0 and TLS 1.0 be disabled. TLS 1.1 or higher must be used and TLS 1.2 is strongly recommended. In addition, starting this July, Google Chrome will begin to mark HTTP web sites as “not secure”. Over the past few years, the internet has swiftly been transitioning to HTTPS, with over 70% of Chrome’s traffic and 81 of the web’s top 100 sites now using HTTPS by default. Let’s look at Nginx tuning tips to help improve the performance of Nginx w/ HTTPS for better TTFB and reduced latency. > If the Protocol column is missing, you can add it using right-click. With HTTPS connections, instead of end-users connecting via one round trip (request sent, then server responds), the connection needs an extra handshake. However, using HTTP/2 and enabling Nginx ssl_session_cache will ensure faster HTTPS performance for initial connections and faster-than-http page loads. Because proper rotation of session ticket encryption key is not yet implemented in Nginx, you should turn this off for now. As we’ve discussed in the opening, HTTPS and HTTP/2 are a move towards the latest, fast and most secure web technology. In light of this, TLS 1.0 should be disabled. OCSP (Online Certificate Status Protocol) stapling, is an alternative approach to the OCSP for checking the revocation status of X.509 certificates. Enabling OCSP stapling allows the Nginx to bear the resource cost involved in providing OCSP responses by appending (“stapling”) a time-stamped OCSP response signed by the CA to the initial TLS handshake, eliminating the need for clients to contact the CA. Also see: Using OCSP Stapling to Improve Response Time and Privacy. Note: ssl_trusted_certificate specifies the trusted CA certificates chain file, in PEM format, used to verify client certificates and OCSP responses. 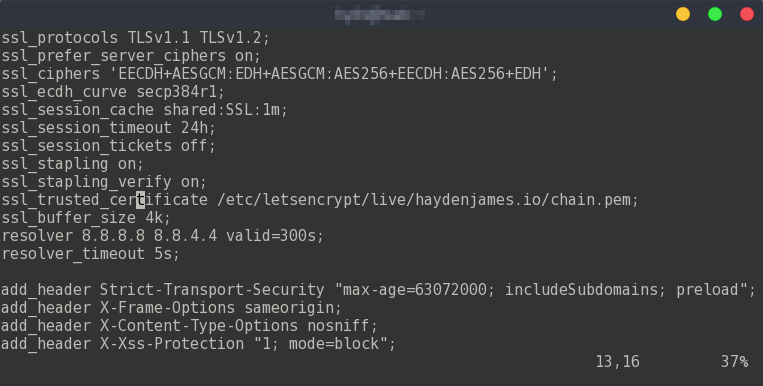 https://istlsfastyet.com – Is TLS Fast Yet?